Public-sector housebuilding remains at some of the lowest levels of the past century and yet, as a new paper by academics Steve Wilcox and Peter Williams points out, government interventions in the housing market ‘are now on an unprecedented scale’. In a paper for the Chartered Institute of Housing this week, they count the ways in which the state is involved, from direct support for construction to regulations on mortgage lending. Most of this government support is specific to private development and – notwithstanding more than a decade of decline in owner-occupation – the promotion of home ownership. A key message is that, while the reliance on market output has increased, ‘the market itself has become increasingly controlled and influenced by government and allied institutions’. One of the central aspects of this is the way in which the tax system provides preferential treatment to owner-occupiers over those in other tenures. This is in fact of longstanding, but Wilcox and Williams put numbers on these tax advantages and they are very, very considerable, adding up to roughly £40bn. That is quite some relief to reserve exclusively for the occupants of one particular tenure – a tenure which after all has become increasingly inaccessible to many. Note that this is enjoyed by existing owner-occupiers: it is of no benefit to those who would like to become owner-occupiers themselves but can’t, and indeed it has probably contributed to the price inflation that has made it so much more difficult for them to buy. Owner-occupiers benefit from two major tax incentives, which arise because the returns on investing in a property are taxed differently according to whether the owner lives in that property or not. One is an exemption from capital gains tax on owner-occupiers’ main homes. Landlords are taxed on the profit they make from house price appreciation; owner-occupiers are not. Wilcox and Williams estimate the cost of this relief to have been £18.7bn in 2016/17. The other tax advantage enjoyed by owner-occupiers is an exemption from income tax on the imputed rent. A landlord pays income tax at their marginal rate on the rental income, net of the cost of mortgage interest on that property, which is an allowable expense; an owner-occupier does not. Wilcox and Williams put the cost of this at £21.3bn in 2016/17. This last – the imputed rent – is the bit that tends to be under-emphasised in the property debate. This is perhaps understandable as many people do not even realise it exists, or if they do they then think it is not a real income. And indeed it isn’t in the sense that no cash changes hands, no transfer takes place, and no transaction is registered (unless the householder is especially fastidious about their accounts). But that doesn’t mean it isn’t a major source of income for owner-occupiers. Consider it like this. When an investor buys a property to rent out, they are buying an asset that will secure them a future return in the form of the rental income; it is for the rent that tenants will be prepared to pay that the landlord is purchasing the property, and the income derived is therefore taxed as such. When an owner-occupier buys a property to live in themselves, in financial terms they are making just the same investment as the landlord. Ownership of the property secures them the rental income due on that property. But instead of letting it out and receiving the rent into their bank account, they live in it themselves. They are now both landlord and tenant and, in effect if not visibly, they are paying the rent to themselves by consuming the accommodation services the property provides. This chart from Wilcox and Williams gives an indication of the sort of sums involved. Should this income be taxed? In fact it was for many decades, a situation which emerged almost by default from the pre-1914 period when the vast majority of homes (probably more than 90 per cent) were owned by private landlords anyway. Landlords were taxed on their rental incomes (minus the cost of servicing the mortgage), as they are now. As then more and more households began to live in homes they owned themselves, this new class of owner-occupiers was required to declare, under Schedule A, the notional rent they would have received on that property were they not living in it themselves. However, consistent with politicians’ desire to promote and incentivise owner-occupation, this requirement was scrapped in 1963 (although, as a further bonus for homeowners, mortgage interest relief remained until it was finally abolished by Gordon Brown in 2000). The mammoth obstacle in the way of what the OECD suggests is of course the politics. For all that owner-occupation has been in decline in England, still about 63 per cent of households are owner-occupied. That is an enormous voting bloc to start poking with what might look like a new and special tax, and that is likely to hit house prices to boot. The other principal concern would be around the ability of owner-occupiers to cover the costs of income tax on imputed rents. It is often noted in debates around reform of council tax that the asset-rich can quite easily be cash-poor. It is sometimes suggested that this might be overcome by allowing such tax liabilities to be deferred until the house is sold. But apart from this, the asset-rich-cash-poor argument only extends so far. In fact, only 13 per cent of owner-occupiers are in the lowest fifth of households by income; 49.3 per cent of owner-occupiers are in the top two quintiles, compared with 35 per cent of private renters and 11.8 per cent of social renters (English Housing Survey, 2016/17). It should also be noted that the £21.3bn of tax relief owner-occupiers enjoy in this respect will be tilted significantly towards those in the biggest, most expensive houses in London and the South-East. 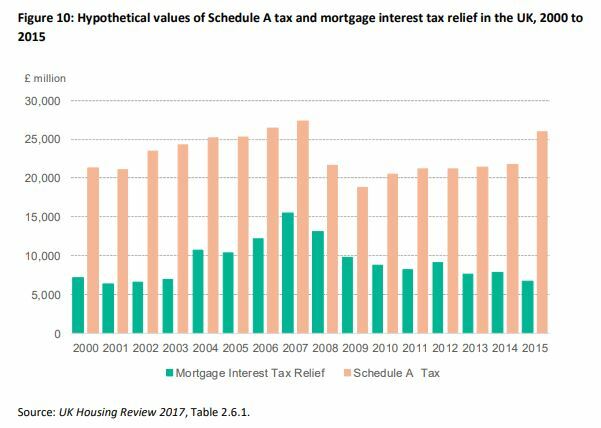 It is also, if mortgage interest relief is assumed to be deductible, disproportionately advantageous to those who have paid off their mortgages and own their homes outright. Outright-owners comprise England’s most populous group by housing situation, having overtaken those buying with a mortgage in about 2013. Some 7.9m households (34.1 per cent of all households) now owe nothing to the bank on the home that they own. 2.8m of those are also in the top two quintiles by income, although it is also important to acknowledge that 1.6m are in the bottom quintile and would presumably struggle to pay any additional income tax (EHS, 2016/17). Politically and practically, this would not be a straightforward tweak for the next Budget. But getting to grips with the housing crisis is above all about dealing with difficult trade-offs between winners and losers. And as we consider who has done well out of the property boom and who has not, and as we consider how to raise money equitably for, say, the health and social care needs of an ageing population, it might be remiss to overlook this quite remarkable tax benefit.